I purchased a 1998 TJ Wrangler Sahara edition two months ago and I'm noticing above average clunking and vibration while driving. Additionally, when I shake the parked vehicle I can hear alot of movement from the undercarriage. In order to address the issue, I'd like to start by replacing the worn lower control arm bushings but I'm having a hard time figuring out exactly what size bushing and heim joint to purchase. It doesn't help that I don't know the brand of the lower control arms as there are no part numbers stamped/etched into them. I've taken some photos and I'm hoping that one of you guys can enlighten me on the matter. Also, if it means anything, the previous owner told me he installed a 3.5" Rock Krawler long arm kit but when I perused the "Rock Krawler long arm kit for TJ's" page, I found no control arms that looked remotely close to what is presently installed. Looks like he meant, short arm... Could still be RK kit. Can we get a wider shot? Ok, back to long arm... Could he have meant rough country? The belly pan center brackets can help with identification. Synergy for the rubber ends, johnny joints for the other... they are supposed to be a direct swap. Or you can do the Clayton Girro Joints instead of the johnny joints. However, the measurements vary in length, outer diameter, and inner diameter. 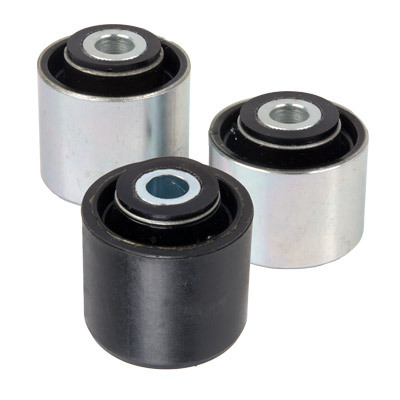 PPM-4320-01 LOWER CONTROL ARM BUSHING 8033, 8036, 8046, 8047, 8051, 8052, 8153, 8154, 8231, 8551-01, 8563-01, 8585 2.618" 9/16" / 14MM 4408-01 2.000" 2.625" 0.188" 2.249"
https://www.claytonoffroad.com/products/brand/redranger will have rod ends, just need to match up the thread size from your existing control arms and then measure the width of the bushing, my control arms use the 1-1/4x12 thread witch only comes with the 9/16"x 2-5/8" wide end, for me it is a custom upper mount ...if I was there, I would just use a dial caliper and you would be measured up in about 10 minutes of crawling around under your jeep. Aren't the Giiro joints the same thing as the Synergy? As I understand it they are both dual dorumeter bushings. So I would use whicher one you can find that fits. Or stick with a JJ if you find it.